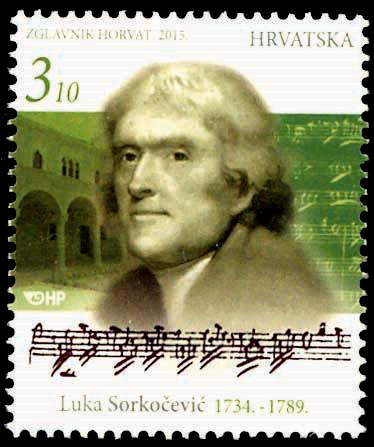 In 2015 the Hrvatska pošta produced a stamp honoring the eighteenth-century Croatian composer Luka Sorkočević, inadvertently illustrated with an image of the U.S. president Thomas Jefferson. The mistake was discovered just before the stamp’s release, and the entire run was withdrawn and destroyed, though one post office had sold 22 examples of it prior to the release date. In view of the events and given the fact that apparently no copies had yet reached the philatelic market, a 2018 advertisement from the auction house Barac & Pervan noted that this stamp should become widely sought after; and since this rarity is also important for the American philatelic market, its value is expected to increase over time. This according to “Unissued stamp from 2015 supposed to show Mr. Luka Sorkočević” (Barac & Pervan 2018). Below, one of the composer’s symphonies. 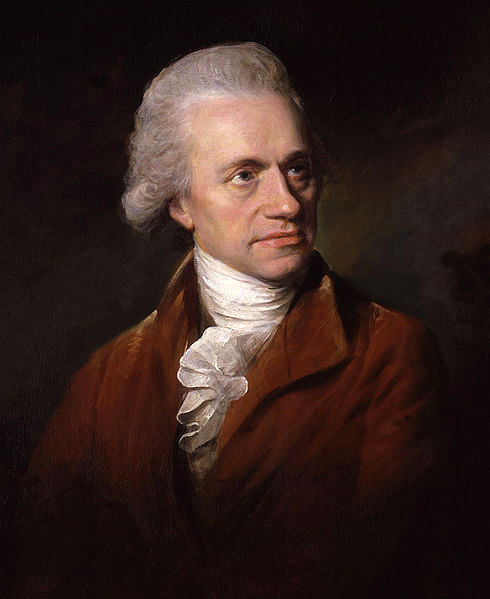 William Herschel’s career shift from art to science can be regarded as a symbol of the change that music aesthetics underwent in the eighteenth century. The traditional view of music’s dual nature as both art and science was widely accepted as the century opened, but it was challenged by a growing interest in issues such as genius and the role of inspiration in the creative process. The nature of musical expression defied rational explanation. The conclusion that genius and inspiration were beyond the law of nature, and that music is not just an expression of natural order but a means by which feelings and emotions can be expressed and thoughts and ideas transferred, contributed to the philosophical background for the Romanticism of the nineteenth century. The arts and sciences had come to a crossroads, and Herschel chose to follow the path of science. This according to “Music: A science and an art—The 18th-century parting of the ways” by John Bergsagel (Dansk årbog for musikforskning XII  pp. 5-18). Today is Herschel’s 280th birthday! Above, a portrait by Lemuel Francis Abbott; below, his viola concerto in C Major. 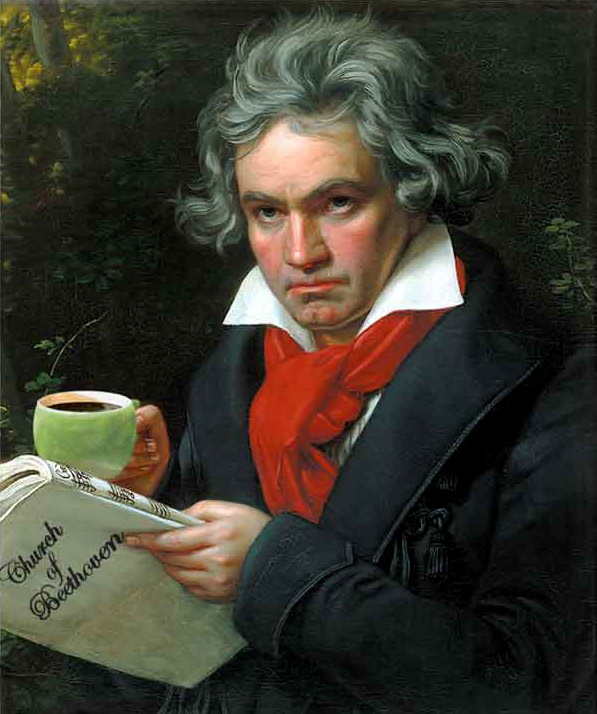 A visitor to the 39-year-old composer’s Vienna apartment described Beethoven’s personal habits in notoriously disparaging detail—a picture curiously contrasting with the same reporter’s observations of his fastidious attention to his favorite beverage. This according to “Beethoven’s 60 coffee beans” by Leonardo Ciampa (The American organist LII/3 [March 2018] pp. 50-51). Below, a highly caffeinated performance by Peter Schickele. In 1904 Ole Lund, a Swedish immigrant living in Minnesota, applied to the Canadian authorities for a piece of land under the Dominion Lands Act of 1872. On receiving the allotment, he moved there with his wife, Julia. The next year the province of Saskatchewan was established, and the Canadian Pacific Railway began its expansion westward; surveyors chose the Lund farm as their base of operation, and it became apparent that there would be a station depot not far from the Lund Homestead. The railroad company offered to name the place Lund. The Lunds declined, and Julie Lund suggested that the hamlet be named after her favorite composer, Mozart. 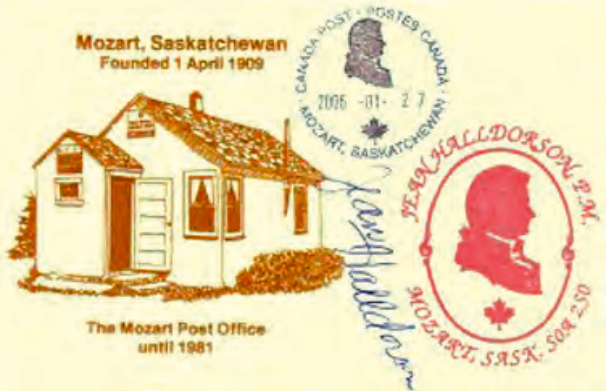 The name was accepted, and Mozart, Saskatchewan, officially came into being on 1 April 1909. In the 1970s postcards with a line drawing of the town’s post office were made available for sale in the nearby cooperative store (above). Mozart’s 222nd birthday, 27 January 1978, was an extremely busy day for the postmaster of the Mozart Post Office, who had to oblige stamp collectors from all over the world who were anxious to have the anniversary cancellation. This according to “The Mozart Post Office” by S. Sankaranarayanan (Sruti 376 [January 2016] pp. 54–55). Below, the celebrated “Letter duet” from Le nozze di Figaro. In 1984 the Scottish National Portrait Gallery acquired two oil paintings signed by Pietro Fabris and dated to 1771. An old label on the frame indicates that the paintings were produced for William Hamilton, the British ambassador at Naples from 1764 to 1800, and the Viscount Kenneth Mackenzie, later Lord Fortrose, who spent time in Naples from 1769 to 1771. While in the first picture, depicting a scene of fencing, a character sitting at the table has been identified as Niccolò Jommelli, there have been many doubts about the identity of the characters in the second picture, showing a chamber concert. They are now identified as Leopold and Wolfgang Amadeus Mozart, the first at the harpsichord and the second, waiting to play, in front of a triangular spinet. 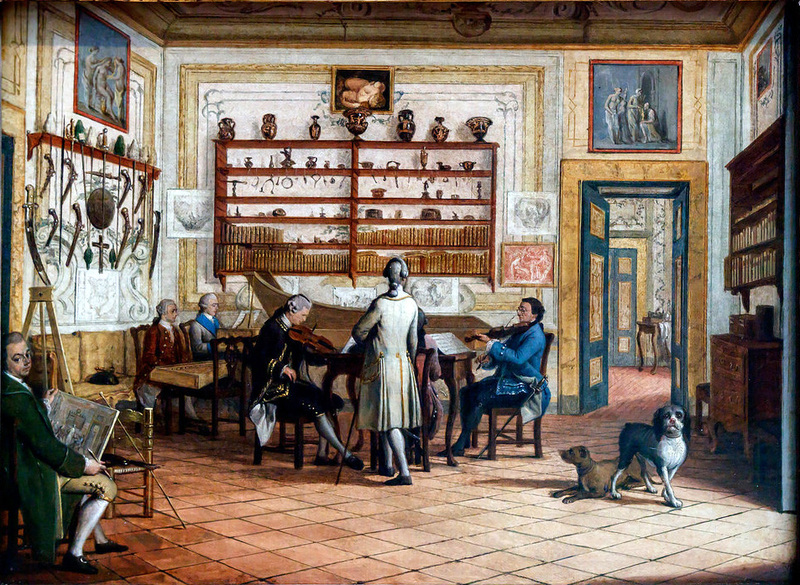 Above, the painting in question (click to enlarge); Wolfgang and Leopold are on the left; Lord Fortrose in in the center, with his back turned, with Hamilton on his left and Gaetano Pugnani on his right, both playing violins. Fabris himself peers out at the viewer from the lower left, holding the painting-in-progress. Below, Mozart’s symphony in G major, K. 74, which he completed during this visit to Naples. 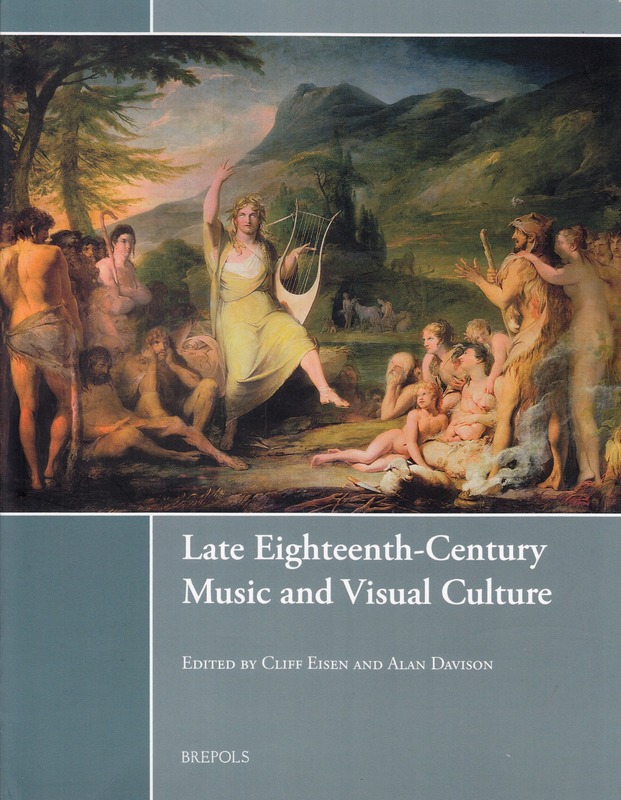 In 2017 Brepols launched the series Music and visual cultures with Late eighteenth-century music and visual culture, edited by Cliff Eisen and Alan Davison. In this volume, nine prominent scholars employ a set of interdisciplinary methodological tools to come to a comprehensive understanding of the rich tapestry of eighteenth-century musical taste, performance, consumption, and aesthetics. While the link between visual material and musicological study lies at the heart of the research presented in this collection of essays, the importance of the textual element, as it denoted the process of thinking about music and the various ways in which that was symbolically and often literally visualized in writing and print culture, is also closely examined. This series will include monographs and thematic collections on issues concerning music iconography and interactions between music and visual arts. The series editor is Zdravko Blažeković. The catalogue arias of late eighteenth-century Italian opere buffe focus on lists; subjects may include enjoyable activities, foods, things for sale, or types of people (by nationality, social rank, occupation, personal qualities, and so on). Their progress often involves shorter and shorter syntactic units: Sentences give way to phrases, then to one- or two-word groups, accelerating the rate of accumulated information—the comic frenzy is actually built into the text itself. This textual compression often involves two rhetorical devices: asyndeton (omitting conjunctions) and anaphora (beginning successive lines or phrases with the same word). This according to “Catalogue arias and the ‘catalogue aria’” by John Platoff, an essay included in Wolfgang Amadé Mozart: Essays on his life and his music (New York: Oxford University Press, 1996, pp. 296–311). 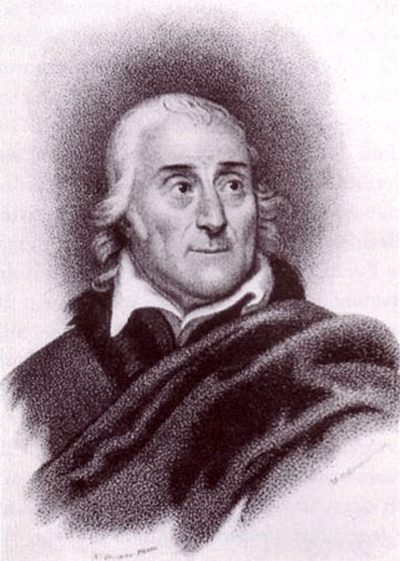 Above, Lorenzo da Ponte, author of the celebrated catalogue aria Madamina, il catalogo è questo, from Mozart’s Don Giovanni; below, Luca Pisaroni does the honors. 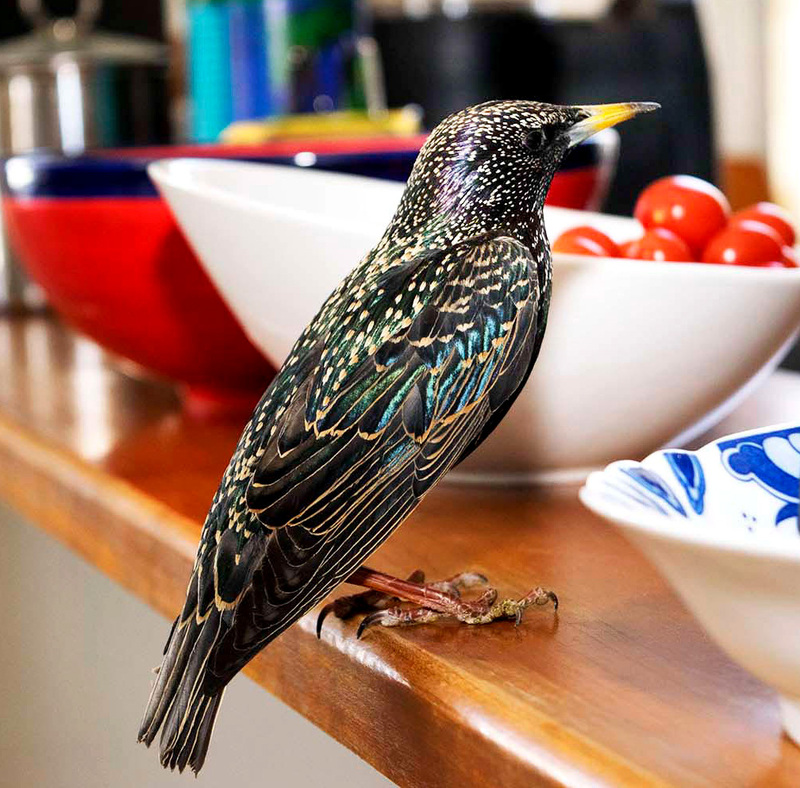 On 27 May 1784 Mozart purchased a European starling (Sturnus vulgaris, above). The pleasure he expressed at hearing the bird’s song—“Das war schon!”—is all the more understandable when one compares his notation of it with the beginning of the last movement of his Piano Concerto in G major, K.453, which was written around the same time. Three years later the bird died, and he buried it with much ceremony. Heavily veiled mourners marched in a procession, sang hymns, and listened to a graveside recitation of a poem Mozart had composed for the occasion. Although many questions remain about starlings’ vocal capacities, a recent study supports a definite link between their mimicry and their lively social interactions, illuminating Mozart’s response to his beloved pet’s death. This according to “Mozart’s starling” by Meredith J. West and Andrew P. King (American scientist LXXVIII/2 [May–August 1990] pp. 106–114). Below, the concerto movement sung by Mozart’s starling. 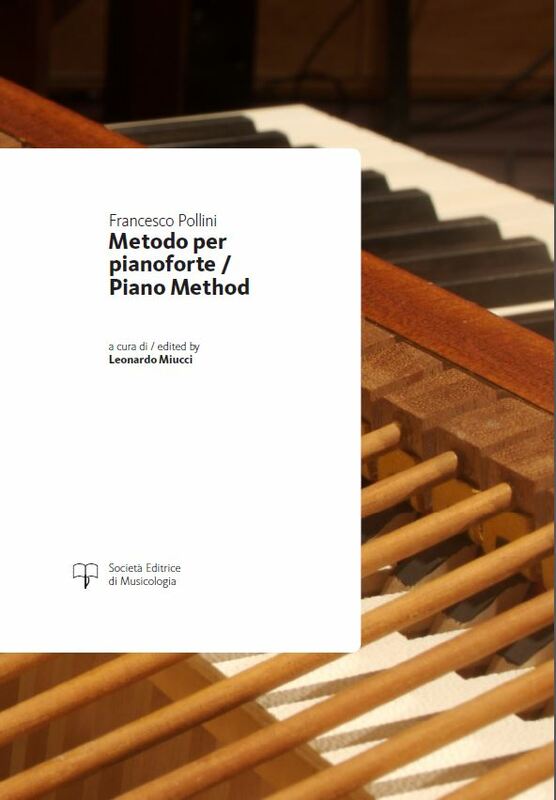 In 2016 Società Editrice di Musicologia launched the series Metodi e trattati with a new critical edition of Francesco Pollini’s Metodo per pianoforte. 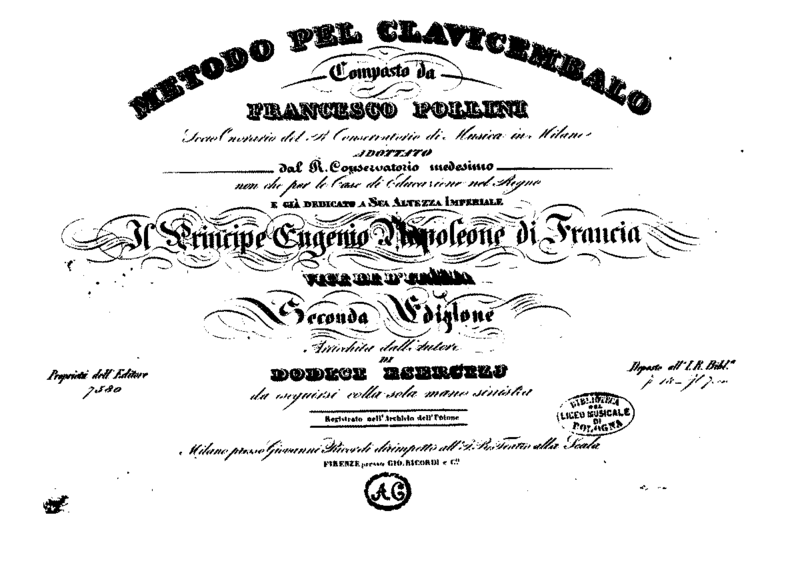 Pollini was the preeminent figure among Italian pianists of the early nineteenth century. A student of Mozart, he enjoyed considerable fame not only as a pianist and composer but also—and above all—as a teacher. 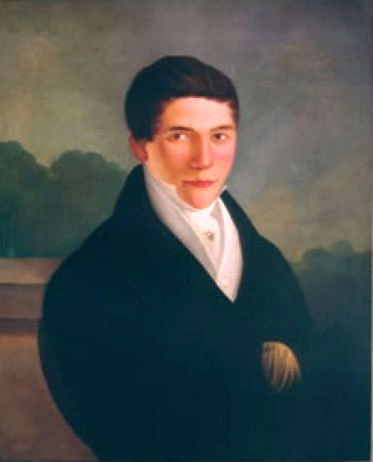 In 1811 the Conservatorio di Milano commissioned Pollini to write a piano method, the first of its kind to be published in Italy. Printed as Metodo pel clavicembalo in 1812 and reprinted in 1834, the treatise covers several aspects of pianistic technique and performance practice. This new critical edition, provided with a parallel English translation, presents the text and its 400 examples and exercises based on the most complete edition of 1834. The introduction retraces the work’s complex publishing history, discusses in detail the typology of the instrument, and examines several technical and performance practice issues addressed in Pollini’s text, including articulation, touch, rhythmic flexibility, improvisation, ornamentation, and pedaling. Below, Costantino Mastroprimiano performs one of Pollini’s works on the fortepiano. 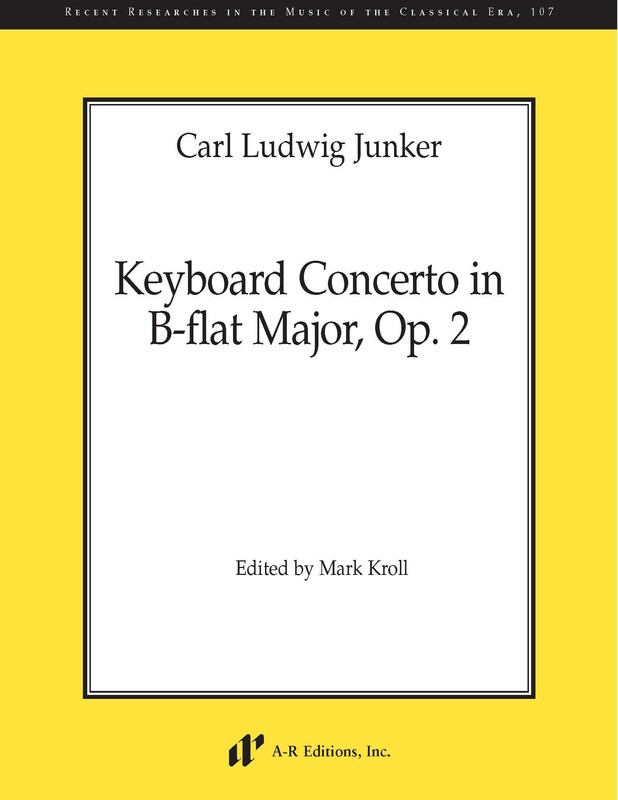 In 2017 A-R Editions issued a new critical edition of Carl Ludwig Junker’s only surviving concerto, edited by Mark Kroll. Junker, a pastor, critic, and writer by profession, is far better known today for his books, articles, and published letters than for his musical compositions. As one of the most interesting and perceptive commentators and theorists of the late eighteenth century, he provided valuable information about musicians and music making during his lifetime. He also wrote twenty-four symphonies (now lost), thirteen piano pieces, and several songs. The concerto presented in this edition enriches our understanding and appreciation of the early piano concerto, a genre that would find its full realization in the hands of Haydn, Mozart, and Beethoven. Below, a recording of the work with Prof. Kroll at the fortepiano.